America, This Is Why You're Fat! Our lives have become increasingly sedentary. Take me. For hours and hours on end, I sit in front of a computer screen. I try to exercise, but I work long days, producing content like this for you to read. To make matters worse, there's the crap we eat and the crap we drink. It's delicious, sure, but it's crap. And if you're living in the U.S., you're not only getting more crap than you probably need, but bigger crap. As gamers and people who enjoy time at home, we're prime fodder for junk food and soft drinks. No wonder beverage makers slap Modern Warfare on their cans, chip companies collaborate with sport titles, and fast food restaurants release game themed food. In moderation, soft drinks, junk food, and fast food are wonderful. Like most people, I try to eat healthy, but have cravings for heart attack inducing, artery clogging snacks. That stuff is damn good! And if you are living in America and going to McDonald's, you're getting more food than you probably need. In Japanese, the term "American size" （アメリカンサイズ) refers to how food, products, clothing, and pretty much everything are bigger in the U.S. In Japan, "American size" is seen as unhealthy and wasteful, even (ditto, no doubt in U.S. as well). However, it's also seen as something appealing and desirable. "American size" is one reason why Japanese people dig going to Costco. The prices are reasonable and the portions are huge. You can stretch a yen further. Japanese food portions are traditionally very small, because people don't want to waste food (clean your plate!). There are other reasons, such as that people traditionally have been of smaller stature. Also, rice is incredibly filling. Last week, a Japanese website ran a video clip of a McDonald's breakfast that clocked in at over a thousand calories. Comments generally pointed out that the meal looked "unhealthy" and "unbalanced", with some of those criticizing the food even pointing the obvious: "Damn that looks good." 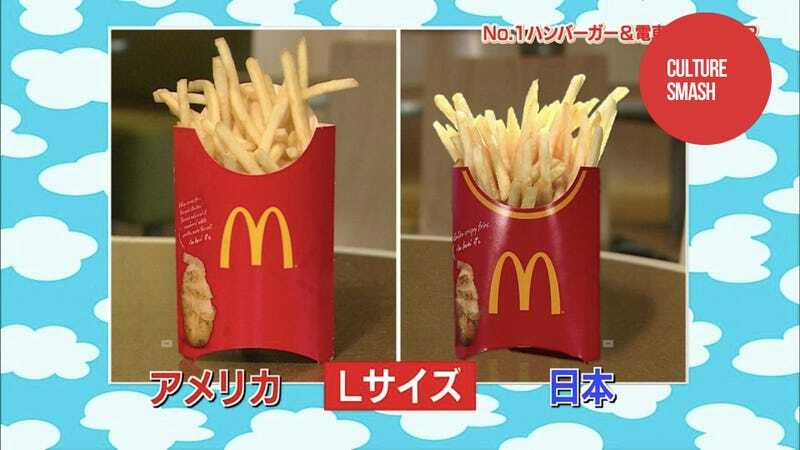 A Japanese television show, Shiru Shiru Mishiru, also recently showed the size differences between food and drinks from an American McDonald's and a Japanese McDonald's. In the gallery, the American sized food is on the left. This sudden interest in jumbo-sized American food comes years after the documentary Super Size Me and as there's concentrated effort recently to roll out smaller sizes in the States—a good thing, no doubt. Restaurants in Japan are increasingly becoming fixated in offered "huge" food items. Portions in Japan continue to get larger and larger. And, as evident by celebrities like Matsuko Deluxe, so do the people. For more big American food pictures, check out ThisIsWhyYoureFat.